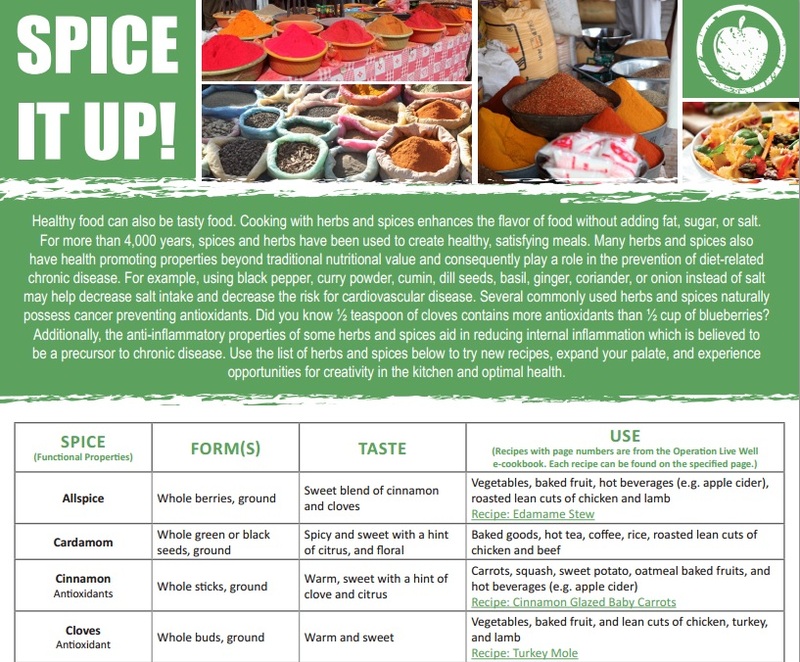 You are at:Home»Cooking»Navy Medicine wants you to use spice. No, not that kind. In an effort to shape up the force and get sailors off the frozen/microwave/fast-food train, the Navy Bureau of Medicine has released a handy chart to help you add some zest to your adventures in home cooking. The list of herbs and spices includes the usual suspects, like cinnamon, pepper and mint, but if you feel like branching out, there’s also cardamom, turmeric and wasabi. The alphabetized chart breaks down each seasoning by their health benefits, their forms (seed, ground, whole, leaves), what they taste like, and what they’re used for. Many of them include a link to a recipe as well. Example: Paprika, an antioxidant and anti-inflammatory, is a ground spice. It can taste sweet or smoky and hot, and you can use it to season everything from veggies and soup to fish, poultry, beef, lamb and pork. Included is a recipe for rotini pasta with red pepper and almond sauce. The complete list is here. And if you just can’t say no to burgers and frozen corn dogs, use the spices and these recipes to make them at home, a healthy and often cheaper option. Anything look interesting? Let us know in the comments. We’re a bunch of volunteers and opening a new scheme in our community. Your web site provided us with valuable information to work on. You have done a formidable task and our entire neighborhood shall be grateful to you.